Big Finish: Doctor Who - THE THIRD DOCTOR ADVENTURES Vol 2 Review | Warped Factor - Words in the Key of Geek. Matthew Kresal checks out the recently released The Third Doctor Adventures, Vol 2 from Big Finish. One of my favorite Big Finish releases of 2015 was the first volume of Big Finish's The Third Doctor Adventures. Like so many out there, I was initially skeptical of Tim Treloar effectively slipping into the large cape left behind by Jon Pertwee as the Third Doctor, but I was won over just minutes into the set. All of which left me waiting for the second volume. So, did it live up to the high standards of the first set? Well Treloar certainly did. The Welsh actor builds on his successful performance in the first release, once again going from strength to strength. The vocal inflections are all there, the tones, the pitch, all of it to the point that I found myself forgetting on one or two occasions that I wasn't actually listening to Pertwee himself, especially in latter parts of the second story. Then there's his chemistry with Katy Manning's Jo Grant which harkens back to the best moments from that era as the two play off each other so beautifully. While he might not be totally spot-on for some, there is no doubting that Treloar has captured the spirit of this Doctor superbly and it's something that makes listening to this set an absolute pleasure. Indeed, the performances are solid throughout. Katy Manning is in fine form as Jo, seeming to have better captured her more youthful voice than she sometimes has in previous releases. Both stories have strong supporting casts including major female characters in the form of Richenda Carey's Mother Finsey and Sandra Voe as Miss Barnett. Bernard Holley, a veteran of the Third Doctor's TV era, is featured in the first story playing a suitably stress inducing corporate manager in charge of a major project. Alongside him there is also Nigel Peever and Karen Henson. The second story meanwhile features a suitably alien sounding George Asprey alongside Big Finish regulars such as Clare Buckfield as Jo's cousin and Richard Earl (perhaps best known to Big Finish listeners as the Dr. Watson of their Sherlock Holmes range) playing a very nice police inspector, with Alex Lanipekun as the younger police sergeant. Like so many of their releases, this one benefits greatly from the quality of acting talent that Big Finish brings to bare. Like its predecessor, this volume contains two stories with one set out in space and the other on Earth. The Transcendence Of Ephros by Guy Adams is the opener with the Doctor and Jo arriving on the titular planet to find a religious group and Galactux Power Inc both awaiting an incredible event that ought otherwise to be impossible. While it gets off to a slow start, Transcendence Of Ephros quickly gathers strength as it presents one twist and cliffhanger after another alongside some neat callbacks to the era on TV. The second story is the Earthbound The Hidden Realm by David Llewellyn which seems to fit into the era perfectly as the TARDIS team head off to Bramfield New Town where the husband of Jo's cousin has become just the latest in a series of disappearances dating back decades. It's a tale that calls to mind adventures like The Daemons and Spearhead From Space, as well as elements of Nigel Kneale's Quatermass II, while also putting Llewellyn's own twist on it. That being said, the two stories perhaps suffer from being paired together as they both ultimately work around a very similar plot point in their latter half, something that perhaps nulls enjoyment of the latter story somewhat. Elsewhere, as well, I found myself missing things from the first set here. 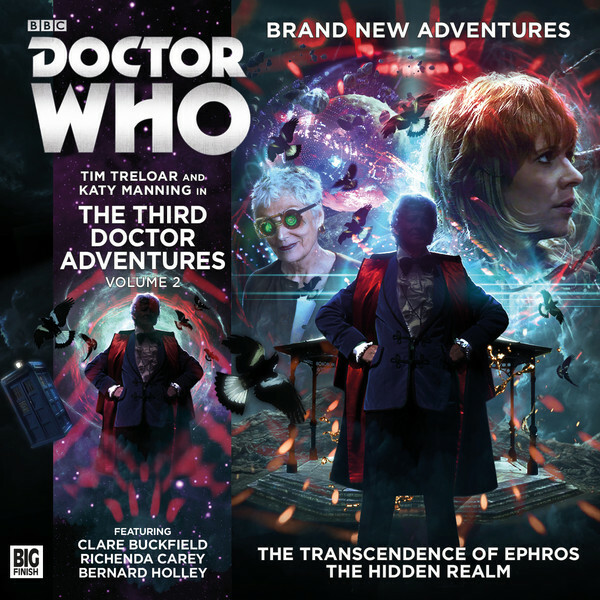 One of the things I loved about volume one (but that other listeners did not apparently) was the narration that Treloar supplied alongside his duties as the Third Doctor, something that gave it the sense of being like a missing story from the era, ala the BBC TV soundtrack releases. Despite being a long-time Big Finish listener, I found myself having a hard time adapting to their usual format being played out with this Doctor for some reason. There's also the matter of the music which in that first release so wonderfully evoked the era, but here only half succeeds as the score to Hidden Realm sounds more like something out of the McCoy era than Pertwee's. These are largely minor niggles I admit but they are something that perhaps takes this release down a peg for this reviewer. While I can't quite put it up on the same pedestal as I did volume one, volume two of the Third Doctor Adventures holds up well indeed. Tim Treloar continues to be an exemplary Third Doctor, capturing both the spirit of Pertwee as well as his chemistry with Katy Manning and both stories are solid outings that evoke very different sides of the era, though also perhaps sufferer from being paired together. If you're aching for more Third Doctor to experience, you could do a lot worse than check out this set.